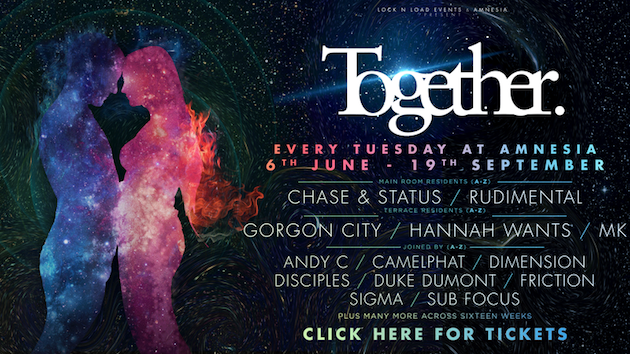 Together has unveiled its full 16-week line-up for Amnesia this summer with the opening party taking place on Tuesday 6th June. Main room residents for the 16-week run will include Chase & Status and Rudimental, whilst the terrace will feature Gorgon City, Hannah Wants and MK. The main room residents will be joined by the likes of Andy C, Netsky, Pendulum, Sub focus and Wilkinson throughout the club night's three month run. Whilst the likes of Duke Dumont, Disciples, Claptone and more will be joining the terrace residents. For tickets and the full 16-week breakdown head here.